It’s important for blood glucose levels to stay in a healthy range. If glucose levels get too low, we can lose the ability to think and function normally. If they get too high and stay high, it can cause damage or complications to the body over the course of many years. Keeping a log of your results is vital. When you bring this record to your health care provider, you have a good picture of your body's response to your diabetes care plan. To help keep track of your levels, we have a printable blood glucose log. We also have a blood glucose log that's smaller so you can carry it with you available for purchase. People with diabetes check their blood glucose levels by poking their fingertips and using a blood glucose meter, or use a continuous glucose monitor that tells what their blood glucose is at in that moment. The A1C is also a blood test but it tells us what blood glucose levels have been over the last two to three months. The American Diabetes Association suggests the following targets for most nonpregnant adults with diabetes. A1C targets differ based on age and health. Also, more or less stringent glycemic goals may be appropriate for each individual. Use Diabetes 24/7, our free online tool, to track and analyze your blood glucose readings. 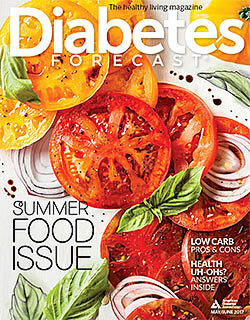 Read about the latest advances in blood glucose meters in Diabetes Forecast's "2015 Consumer Guide".